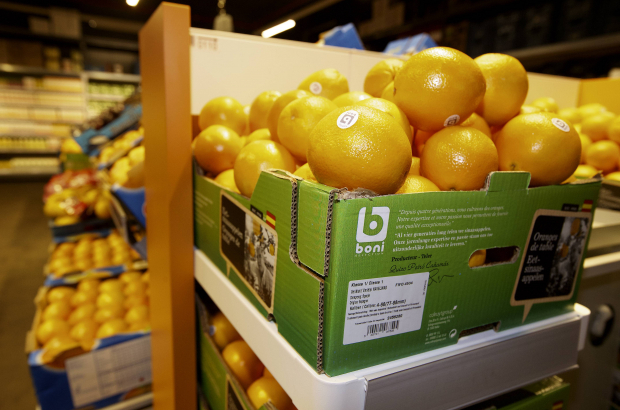 Healthy eating scores are starting to appear on food packaging in Belgian supermarkets to help customers see at a glance which products are good for them and which to avoid. The nutri-score index, which already exists in the UK and France, provides an easy-to-read diagram, ranking a product from the healthiest (dark green, A) to the least healthy (dark red, E). Sugars, fatty acids, salt and high calory counts all contribute to a negative score, while the presence of fruit and vegetables, fibre and protein can improve the overall score. Delhaize has become the first to implement the new scheme on products ranging from soups to breakfast cereals. The supermarket chain aims to extend it to all of its own-brand products within two years. Colruyt will begin displaying nutri-scores from late September, starting with a dozen of its Boni own-brand items. A Carrefour spokesman said it would follow accordingly. Federal health minister Maggie De Block said the nutri-score system was optional and encouraged food producers to embrace it. But Belgian food industry federation Fevia said: "In our opinion, this is not the right tool to lead people to a more balanced diet." Fevia considers the colour coding "too simplistic", adding: "Two different consumers may have completely different needs in terms of food." The organisation says it could also be harmful for sales of Belgian chocolate. "It's a product we should be proud of," Fevia said. "Do we really want to export it with a red warning sign on the packaging?" Healthy eating should start with healthy packaging that can be recycled and does not leave a footprint on our planet. Suggest we all revert to the old types of packaging, like the inner layer of white paper, paper and different types of cardboard and use recycled glass. Food wrapped in plastic and comes into contact with different temperatures ignites harmful chemicals that causes humans and animals to have health problems. Years ago shops sold fruit and vegetables in punnets (a small light basket or other container for fruit or vegetables ). Plastic drinking bottles also contain harmful chemicals. Food for humans and animals should be served on ceramic plates, ceramic bowels or on paper plates. Sugar, fatty acids and salt should be taken in moderation. Breakfast cereals are often made of corn which has often been burnt and then coated with sugar and salt. Eating burnt grains in breakfast cereals is also harmful. It has been medically proven that dark Belgian chocolate is healthy to eat. Dark chocolate is loaded with nutrients that can positively affect your health. Made from the seed of the cocoa tree, it is one of the best sources of antioxidants on the planet. Studies show that dark chocolate (not the sugary or milky crap) can improve your health and lower the risk of heart disease. Doctors strongly advise us to eat food that is NOT processed. Food should be clearly labelled so that the general public can also understand it. Guess where some of our health problems are coming from? Probably from the side effects of the food that we buy and eat and the packaging that food is wrapped in and all the plastic bottled drinks. Sadly, not everything is mentioned or visible on food labels or on the packaging.